My husband’s coworker brought cauliflower mushrooms to the office, offering them around for folks to take home and try. His friend had gathered them in the forest, selling some on Craigslist for $40/lb and giving the rest to him. I’m easily terrified by home-foraged wild mushrooms. When my husband brought the big brain-like mushroom home, his story and Wikipedia’s assurance that this type of mushroom has a unique look with no similar poisonous varieties were not enough for me to want to cook and serve it. Luckily I have a friend who is a true mushroom expert and I texted him a photo (this, apparently, is one of the few mushroom varieties that can be reliably identified from a photo, which speaks to how unique it is). He got back to me quickly and assured me that I indeed had a delicious cauliflower mushroom (Sparassis crispa) and I should go ahead and cook it up. He said an enormous one had grown in the woods near his house for several years running (and made its way into his kitchen). Poking around the web I discovered that the cooking advice for these is to boil them, quite unlike the treatment for most wild mushrooms which are typically sautéed. 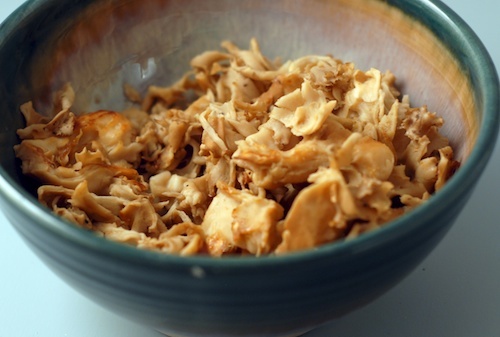 Cauliflower mushrooms have a firm texture which requires more cooking. Our mushroom had spent days chilling in the office fridge before I got it but still looked decently fresh. My husband was game to clean it. He soaked it in cold water for about ten minutes, swished it around, and then painstakingly picked off all the little specks of dirt and plant material. That process involved much poking and shredding and the mushroom went from a big coral-like mass to a bunch of bite-sized shreds. I simmered the shredded mushroom in about four cups of vegetable broth. After ten minutes it still had a bit more substance to it than I wanted to bite into so I simmered it for another ten (your mushroom, if fresher, may not need so long). I could have then fried it, but I used it as is to make mock noodles topped with stir-fried veggies. I repurposed the remaining stock, now mushroom infused, by pouring it into the pan with the mostly-done stir-fried veggies and letting them absorb the flavor as it boiled off. The mushroom made a very convincing and excellent ‘noodle.’ It had softened but still had a firm, meaty texture; the twenty minutes of simmering was not too much. Even though it had filled the kitchen with an intensely woodsy, mushroomy fragrance while on the stove, it had a very mild taste. It is supposed to have immune-stimulating properties and be helpful for asthma so it may have done us good. I hope it will not be the one and only cauliflower mushroom to make it into my kitchen and onto the pages of Fit and Fed, but given that it’s not often sold, it may be. I’m so glad I was able to verify its identity and cook up this rare forest treat! 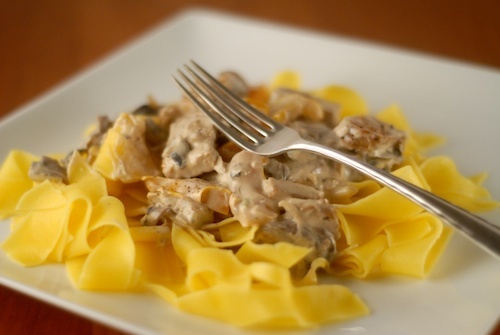 Vegetable Stroganoff Two Ways A vegetable stroganoff with sour cream, mushrooms or cauliflower, and tempeh makes a comforting dinner. 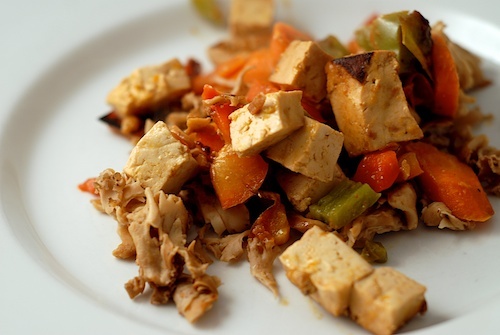 Serve it over egg noodles or rice. Supplements and Diet to Encourage Nerve Healing Diet and supplements to encourage nerve healing. Vegetarian Mushroom ‘Bacon’ Mushroom 'bacon' made with portobellos or shiitakes. 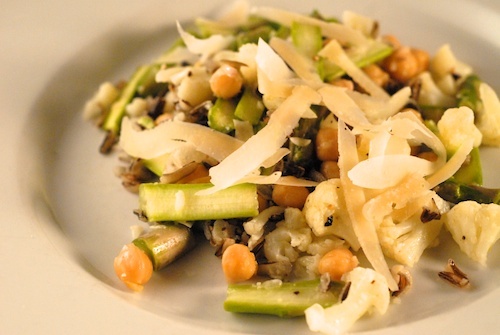 Early Spring Chopped Salad with Asparagus and Cauliflower An early spring salad using the first asparagus, as well as steamed cauliflower, chickpeas, and wild rice. Loving all these veggies–looks delish! Thanks, Ari! And thanks for stopping by and saying hi! Never heard of these before. They look tasty! I hadn’t heard of them until my husband offered to bring some home, but they are tasty! Yum, these looks delicious, thanks for sharing this and putting it on my radar! Thank you, Ayngelina, I hope you run across some cauliflower mushrooms to try at some point!